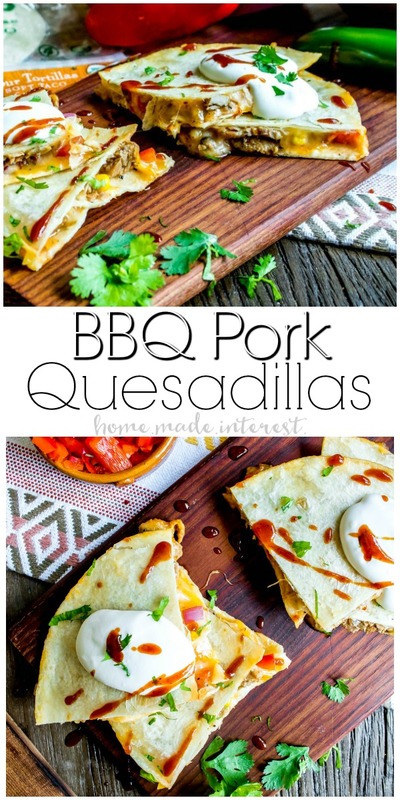 BBQ Pork Quesadillas - Home. Made. Interest. 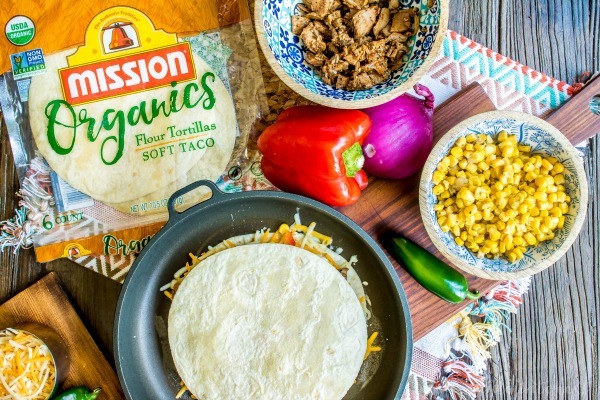 These easy BBQ Pork Quesadillas make a quick dinner recipe for busy weeknights! School will be out soon and that means the kids and I will be spending our days hanging out at the community pool. I don’t know who is more excited me or the kids!! 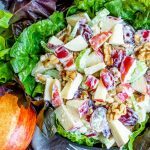 Long days swimming mean that we come home hungry and I need to get lunch or dinner on the table quick. 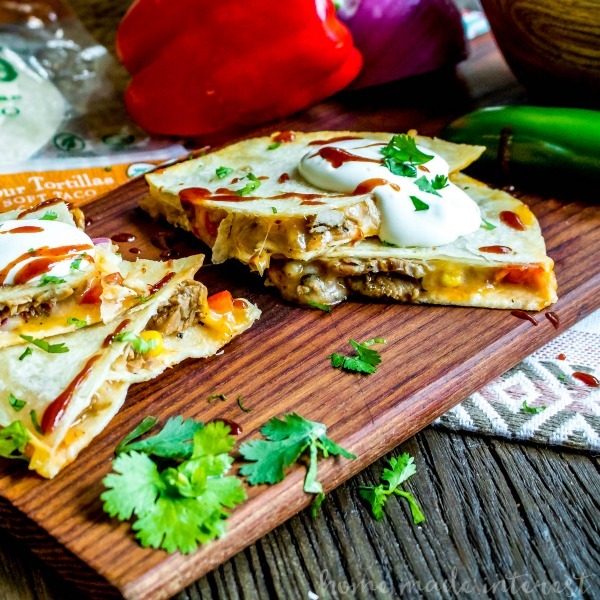 These BBQ Quesadillas are a family favorite and they only take 15 minutes to make! I love a good quesadilla. 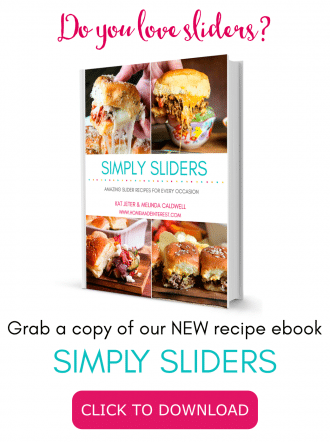 They are like the Tex-Mex version of a grilled cheese sandwich with ooey, gooey melted cheese and all sorts of awesome combinations of meats and veggies. Quesadillas were one of the first things I learned to make for myself and I used to make them as an after school snack in high school. 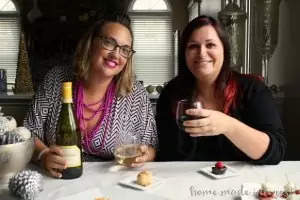 It’s total comfort food to me! Now that I have kids of my own I’m passing on that love of a good quesadilla and we are always trying out new flavor combinations. 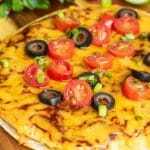 Our current favorite is this super easy BBQ Quesadilla recipe. It’s filled with shredded pork, bell peppers, corn, a little onion (more in mine than theirs ;)), jalapeno if I’m feeling a little spicy, and a drizzle of sweet BBQ sauce. The key to this BBQ Pork Quesadilla is cooking it in a skillet with a little butter. I’ve always cooked my quesadillas this way but the first time I shared about it on the blog I got so many comments on it. I guess a lot of people make theirs in the oven but I’m telling you guys a skillet is the way to go. The tortillas get nice and toasty, slightly crisp on the edges but not crunchy, and all of the delicious cheese melts perfectly in the middle. My BBQ Pork Quesadillas are filled with chopped pork that has been lightly tossed in BBQ sauce and all sorts of fresh summer veggies. I use whatever we have on hand but the corn and bell peppers are a must. They add just a little bite to the quesadilla and they taste so good mixed with the BBQ sauce. Drizzle a little extra BBQ sauce over the top along with some sour cream and fresh cilantro and, boom, lunch or dinner is ready. That means the kids and I get to stay at the pool as long as we want because I know I can come home and have BBQ Pork Quesadillas on the table in about 15 minutes! 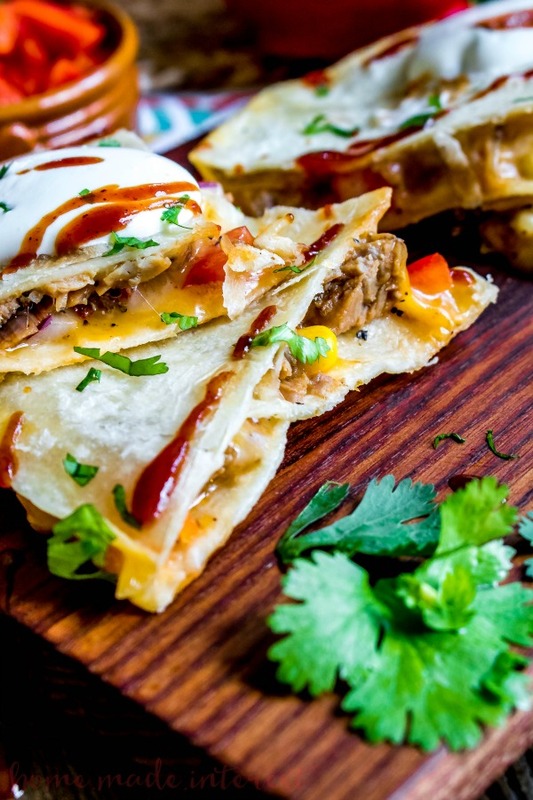 These easy BBQ Pork Quesadillas are a twist on classic comfort food with tangy BBQ sauce and pulled pork stuffed between two flour tortillas and covered in ooey gooey cheese! Preheat skillet on medium heat. Toss pork in BBQ sauce. Add butter to skillet and let it melt over medium high heat. Place one tortilla in the skillet. Sprinkle half of the cheese over the bottom tortilla. Add pork, onions, red pepper and corn to tortilla distributing it evenly. 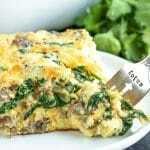 Add the remaining cheese and place the second tortilla on top. 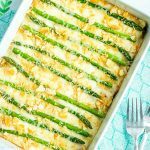 Cook until cheese melts; about 2 minutes. Using a wide spatula, flip quesadilla and cook for 2 more minutes. Garnish with sour cream and cilantro if desired. 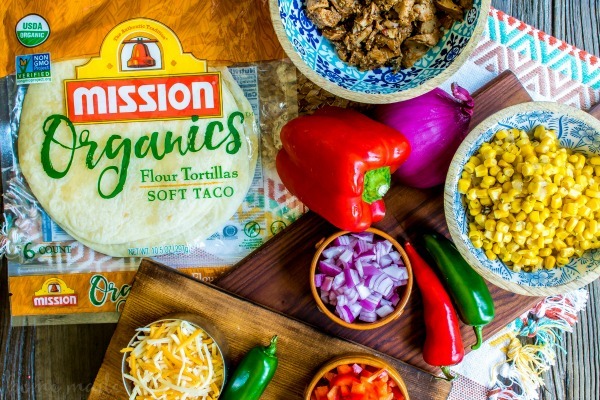 If you’re looking for Mission Organics Tortillas you can find them HERE along with some more awesome recipes you can make for your family!